Just for fun I added a backslash before the ", i.e. Also I observed code at the end of the link text breaking the link markup. Here's the thing. We insert an invisible, optional non-breaking character after 60 uninterrupted characters, every 20. 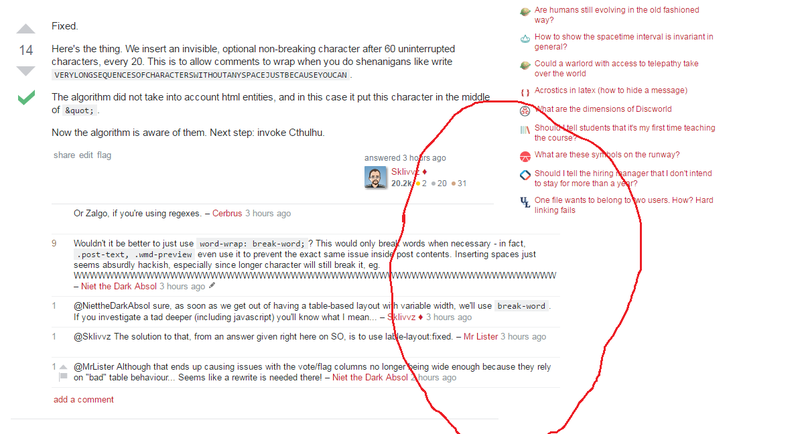 This is to allow comments to wrap when you do shenanigans like write VERYLONGSEQUENCESOFCHARACTERSWITHOUTANYSPACEJUSTBECAUSEYOUCAN. The algorithm did not take into account html entities, and in this case it put this character in the middle of &quot;. Now the algorithm is aware of them. Next step: invoke Cthulhu.